All Digimage Arts products come with a 30-day Money Back Guarantee. If you are not satisfied with a product, you may return it within 30 days of your date of purchase for a refund of the purchase price (less shipping and handling costs, if any). Color It! is an multi-award-winning, fully-featured image editing program with sophisticated paint tools that is easy to learn and use. Quick and efficient, Color It! runs in as little as 6 megabytes of RAM, yet offers powerful capabilities without the high cost and steep learning curve of other image editing programs. Color It! has everything most people need to improve, edit and modify images or create their own from scratch. Images can be saved in many different formats for use as high-resolution print or web images, or as animated GIFs. 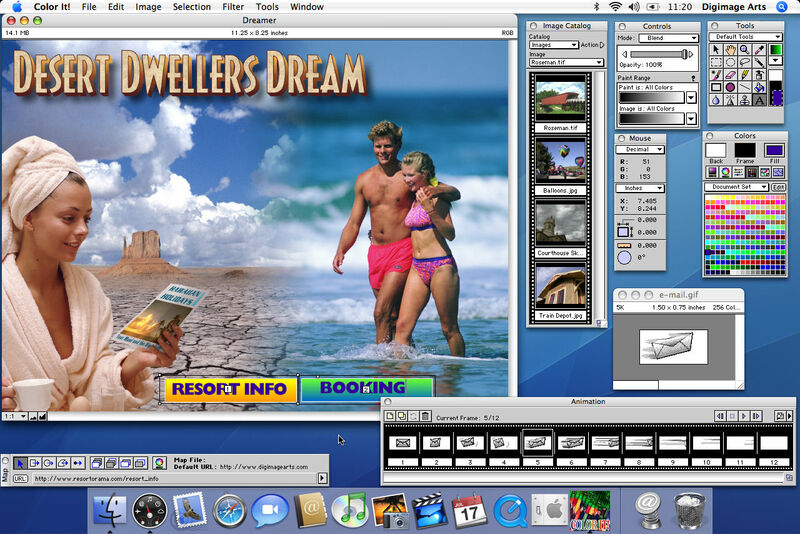 Easily manipulate and blend images in ways limited only by your imagination! Features include a fully customizable tools palette and over 75 built-in filters and effects, including drop shadow, extrude, and scratch and dust removal. Patterns can be created, saved, edited and used as fill or applied with a brush with complete control over size, shape, opacity and more. Color It! supports pressure-sensitive tablets, input from digital cameras and scanners, and most Photoshop-compatible third-party filters. Higher-end features not available elsewhere in this price range include CMYK four-color separations and the ability to create your own convolution filters. UPGRADES: If you own Color It! version 4.0 or Enhance version 4.0, you may upgrade for $39.95. You will need to provide your Color It! 4.0 or Enhance 4.0 Registration number when you order (your Registration number can be viewed by choosing the About Color It! or About Enhance command under the Apple menu). If you own a previous version of Color It! or Enhance, or any version of our other products (Digital Darkroom or wwwART), you may purchase Color It! 4.5 for $49.95. Click here for a larger screen shot. System Requirements: This English version requires a Macintosh computer with a G3 or greater PowerPC chip (G3, G4 or G5) or a Mac with an Intel chip, a mere 6 megabytes of RAM, a hard disk with at least 20 megabytes free, and the Mac OS X operating system, version 10.1 to 10.6 (Color It! 4.5 will not function in Mac OS 9 or earlierfor that, you need Color It! 4.0, which is also still available). Although not a Universal Binary, Color It 4.5 is fully compatible with Intel-based Macs and runs very quickly utilizing Apples Rosetta technology (but will NOT run in Mac OS X 10.7 “Lion” or later OS versions more info). The 16.2MB Color It! 4.5 Manual.pdf may be downloaded here. See ORDER INFORMATION below or BUY ONLINE NOW. NOTE: The download version does not include extras on the CD-ROM version: 65 predefined masks and over 100 royalty-free images. Physical CD-ROM shipments cannot be ordered online. Color It! version 4.0 for Mac OS 9 and before is still available as well (see Order Information below to order). Note that version 4.0 will run in Classic mode on PowerPC-based Macs, but will not run on Intel-based Macs or any Mac running OS X 10.5 (Leopard) or above as those do not support Classic mode. Enhance® is similar to Color It! 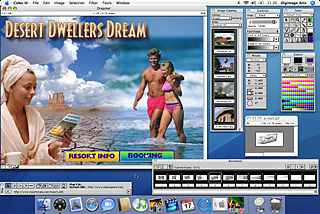 but offers layers capability and professional-level control for serious image manipulation, editing, and retouching. 16 levels of Undo/Redo, multiple layers, Web-ready features like GIF color table minimization and image map creation, and support for pressure-sensitive tablets and most Photoshop-compatible plug-ins make Enhance a powerhouse tool for graphic designers. Multiple layers permit repositioning individual elements without affecting other parts of the image. Enhance features full support for Photoshop-compatible filter, export and acquire plug-ins (including multiple-acquire), pressure-sensitive tablets and drag-and-drop. Professionals will appreciate CMYK four-color separations, advanced 8-bit masking, 33 built-in filters including convolution filters, levels, curves and unsharp masking, and the ability to paint patterns as easily as solid colors. An integrated image browser lets users create and modify image catalogs. And the fully-customizable tools palette lets users create and save their own sets of tools. Enhance also includes a 240-page printed manual. Click here for a larger screen shot. UPGRADES: If you own a previous version of Enhance or any of our other products (Color It!, Digital Darkroom, or wwwART), you may upgrade for $69.95. System Requirements: Enhance requires a Macintosh computer with 6MB of RAM, a hard drive with 10MB free space, and System 7.0 or greater. Please note that while Enhance will run under the Mac OS X operating system, it still is a Classic application and is not a native OS X program. It will run in Classic mode on PowerPC-based Macs, but will not run on Intel-based Macs or any Mac running OS X 10.5 (Leopard) or above as those do not support Classic mode. Digital Darkroom® is an exceptionally easy-to-use program for importing images from scanners or digital cameras and performing basic image editing and manipulation. A simple click on sample images performs most modifications and instantly preview the results. The AutoMagic menu performs the most-needed adjustments automatically including Auto Straighten, Auto Contrast and Auto Enhance. 4 levels of undo, support for scanner plug-ins (with multiple-acquire auto-save) and Photoshop-compatible plug-ins for filters, export, and file formats make Digital Darkroom versatile and fun! Perfect for novice users. Click here for a larger screen shot. 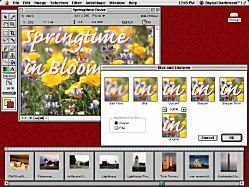 Digital Darkroom requires any color-capable Macintosh (68020 processor or greater) with 3MB of RAM and 30MB of hard disk space running System 7.0 or greater. A color monitor is recommended. 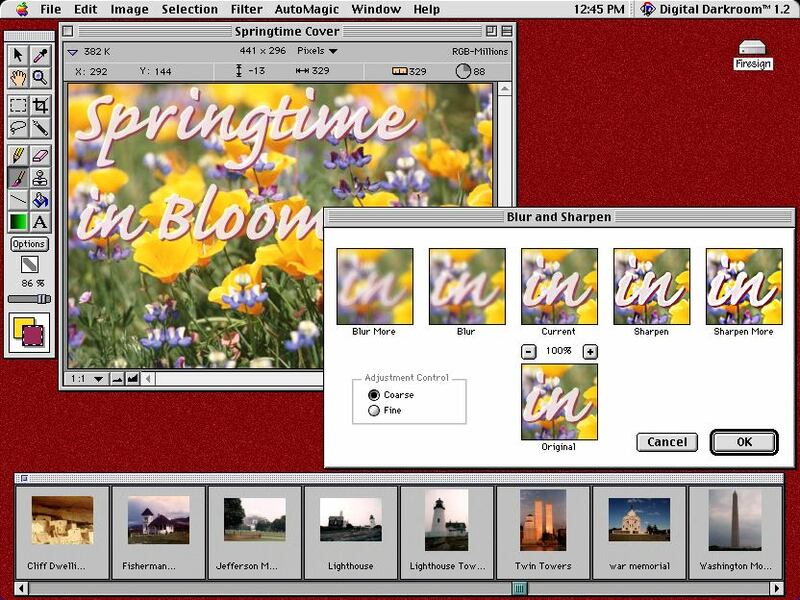 Please note that while Digital Darkroom will run under the Mac OS X operating system, it still is a Classic application and is not a native OS X program. It will run in Classic mode on PowerPC-based Macs, but will not run on Intel-based Macs or any Mac running OS X 10.5 (Leopard) or above as those do not support Classic mode. Digital Darkroom requires any color-capable PC running Windows 7, Vista, XP, ME, 98, 95 or Windows NT 4.0 or later with 3MB of RAM and 30MB of hard disk space. A 16-bit (thousands of colors) monitor is required. For more information about special educational pricing, contact our sales department by phone at (515) 462-1874 or by email. We accept school purchase orders. We accept VISA, MasterCard, and Discover. We also accept personal checks or money orders payable in U.S. funds only. PayPal and American Express is available for online purchases only. SHIPPING AND HANDLING is $5.00 for U.S. destinations ($15.00 for Enhance), $7.00 for Canada ($45.00 for Enhance), and $28.00 for international destinations ($65.00 for Enhance). Shipments in the U.S. and Canada are sent via First Class mail. International shipments are sent via Priority Mail where available (usually 6-10 days). Expedited delivery: 2-day and overnight shipping is available if ordered before 2pm local (U.S. Central) time. The costs vary depending upon the shipping destination and the type of delivery. Please call us toll-free at (515) 462-1874 or +01-515-462-1874 or e-mail us for more information.